Smartphones and Tablets have become a part of our everyday lives, but how are they typically held and used? People use both Portrait and Landscape orientation to conduct their everyday tasks such as watching a video, taking a picture or even browsing the internet from their device. Why is this important? Ultimately, what we need is versatility among the tablets and smartphones of today and tomorrow. We need websites that can predict and that adapt to a user’s orientation. In the MOVR 2017 Q2 report, we have updated a study that measures the orientation at the time we detect the device (usually the initial page load). Most smartphones are used in portrait orientation, with the most popular size (6 to 6.5”) showing 91% portrait usage. In 2017 Q2, only 4.2% of all tablets were shown to be <7” in size which most likely explains the increasing trend in landscape orientation usage. Smartphone screen sizes of 5.5 to 6” grew from only being 7.5% in 2014 to 43.3% in 2017, which is a monumental increase in the percentage of them in the market. The trend continues to grow and with it we see that the screen size of the most used smartphones (5.5 to 6” and 6 to 6.5”) directly correlates to the sizes with the highest use of portrait orientation. 2) full-size, larger tablets (over 9″ diagonal screen size). Moving from the large smartphones to the “mini” tablet size (7-8”), there is an immediate 34% increase in landscape orientation usage. Landscape usage continues to grow as tablet size increases. (The 8 to 9” category is the only exception to this trend, but it is still 17% higher than the large smartphone category). Larger tablets are more likely to be used akin to a desktop computer with users purchasing a keyboard and using it in landscape orientation because the screen size is naturally bigger. There are certain applications that also force the user to use landscape orientation such as Netflix and YouTube which are more likely used more on larger tablets for viewing pleasure. However, the “mini” tablet segment is more likely to be used as readers – or for reading websites that are more prone to a single vertical column. Apple is the only brand with more landscape orientation. This can be attributed to the Apple iPad Airs (9.5 to 10”) which hold the most significant market share for tablets. Samsung controls the tablet market share in both South America and Africa with their Samsung Galaxy Tab 3 Lite (7 to 7.5”) but that still pales in comparison to the grasp Apple has on the market. 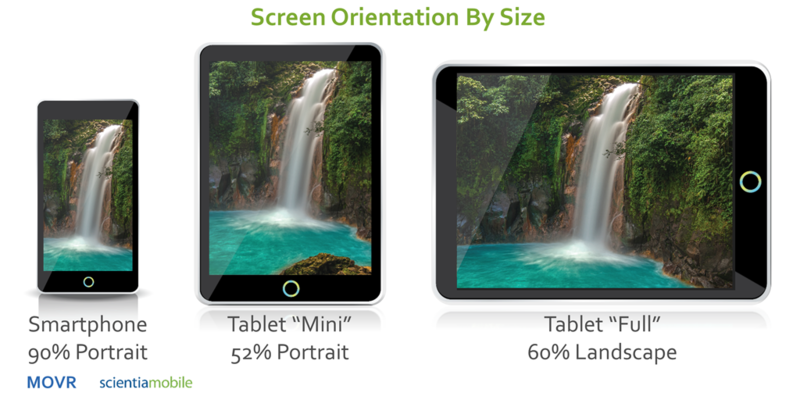 The smaller screen size tablet could attribute to a more even distribution of usage between portrait and landscape orientation.